There's good reason for skepticism when former Massachusetts Gov. 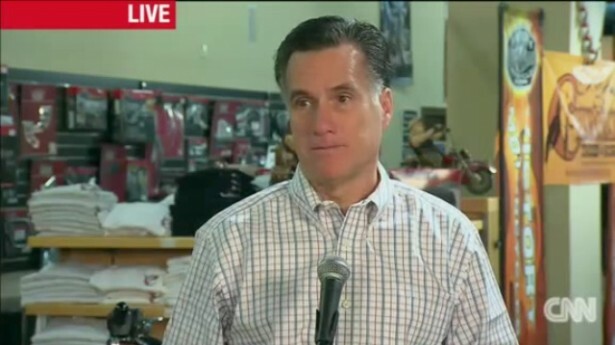 Mitt Romney showcases his business background. According to a new Pew Research Center survey, 66 percent of respondents agree that there are "very strong" or "strong" conflicts between rich and poor in America. This is up from 47 percent that agreed with this two years ago. In a Gallup poll last October, 52 percent said they trust the "ideas and opinions" of President Barack Obama for creating jobs compared to 45 percent that said they trust executives of major corporations. The point is, sadly, there is mistrust in America about the very thing that any conservative will tell you is the mother's milk of our country -- freedom and free enterprise. Mistrust in our country about free enterprise has always been a problem but never more than now. First, we have never had a left wing ideologue occupying the White House like we have today. The man is serious and committed. He told Americans he would change the country, and change it he has. Now he is about to run for a second term with no pretensions about who he is. He is going to run on a platform of so-called fairness and against what he will label unbridled, merciless capitalism. Republicans will have their work cut out to defend business and freedom against this onslaught, particularly in today's environment of mistrust about these very things. Second, our nation is at a genuine crossroads. Even if we could scale back the trillions in new spending that Obama has larded into our federal budget, we would still be in trouble. Government has taken over major parts of American life and to regain our vitality, significant reforms must be made. Even if Obamacare is repealed, American health care is still in crisis. We'll need creative market based reforms to alter the way Americans get their health care. Our entitlement morass can only be fixed with market-based reforms that involve phase out of government and phase in of ownership and choice. Reforms of major areas of American life where Americans have grown accustomed to the heavy hand of government will be impossible if a large percentage of our population is mistrustful of free markets and business. To get this kind of change, leadership that inspires trust in free enterprise is essential. There's good reason for skepticism when former Massachusetts Gov. Mitt Romney showcases his business background as the reason he will inspire this kind of trust. America's biggest and most powerful businesses are notoriously unreliable defenders of free markets. They have a deserved reputation for being unprincipled. Take Romney's own former company Bain. Among top 100 contributors to each member of congress in each election since 2000, of the 29 members where Bain appears in these top 100, 26 are Democrats. Bain executives generously supported champions of big government including former Rep. Anthony Weiner of New York, Sen. Al Franken of Minnesota, Sen. John Kerry of Massachusetts and the late Sen. Ted Kennedy of Massachusetts. Executive ranks of Bain, the bastion of capitalism that Romney led for 25 years, are populated by left wing Democrats. Businessmen may roll their eyes when Rep. James Clyburn, D-S.C., former head of the Congressional Black Caucus, says, as he did the other day, that one of America's most notorious crooks, Bernie Madoff, did what he did "in the name of capitalism." But, unfortunately, Clyburn expresses the sentiments of many blacks. And corporate America enables this through the millions it pours into left wing organizations -- the Congressional Black Caucus, the NAACP and the National Urban League. American big businessmen are generally about expediency, not principles. Expedient better describes Romney than moderate or conservative. He may be saying what sounds good now. But it's the expedient thing to do. Unprincipled business leaders helped lead us into the mess we're in today. More expediency is not going to get us out of it. Only principled leadership that inspires trust in free enterprise and capitalism will.